For people who have heard of stinging nettle or urtica dioica, one of the most common uses is in cosmetic products such as hair and skin care. However, there are many other uses for this plant that might just amaze you. Using the extract or brewing the tea has been shown to be beneficial for many ailments according to some tests, and if you’re considering stinging nettle tea, check out this list of the 5 ways it might amaze you first!! 1. Nutrient packed Body Cleaner! Stinging nettle uses include both providing abundant amounts of nutrients and also serving as an effective cleanser of the whole body of various wastes! It’s thought that stinging nettle tea can safely and gently stimulate the lymphatic system, although this has not been proven. 2. Anemia and Fatigue! Women frequently battle both the physical effects of anemia and also fatigue caused from daily life or nutrient imbalances. Because of the iron content of stinging nettle leaf extract, teas brewed from this pointy perennial can promote healthy energy and vitality. 3. Asthma Relief, Allergies and Hives: Some studies have shown that stinging nettle tea can be useful as a treatment for seasonal allergies and many related symptoms. 4. Prostate Gland Symptoms Relief: Enlarged prostate glands are reportedly treatable with nettle leaf benefits. In fact, thorough tests have been conducted indicating that nettle can be good for the prostate. 5. Women’s Troubles: PMS symptoms and those associated with menopause are thought to be treatable with stinging nettle tea. This could be for many reasons such as its ability to reduce inflammation or its rich nutrient content. All supplements carry risk of side effects and also medication and health condition interactions. As such, it’s imperative that you speak to your health care provider before using stinging nettle regularly. If you have health conditions such as diabetes or, if you are pregnant or nursing, do not use stinging nettle, even when brewed into a tea as doing so can be hazardous. 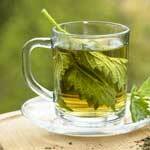 Stinging nettle tea has been brewed the world over to help relieve external itchies and internal ouchies. It’s likely that as research continues, many new purposes for stinging nettle will be found. In the meantime, brewing yourself a cup of this tasty tea might give you a wealth of benefits beyond deliciousness.